"You met a guy in a pub and he put his cheese-grater in your hand and asked you to play with it?" my son says, as I'm telling him about my recent trip to Yorkshire for a science lecture. "That's some kind of gay euphemism, right?" "Wrong," I tell him. "I've never been gay. You're the living proof, as is your brother. I was married to your mum for years. Centuries in subjective time." "There you are then," he says. "Sounds like an experience that could turn a guy gay." "You can't get turned gay," I say. "Though I did hear your mum hung out with butch babes after we split. Maybe I turned her." "So what does 'play the cheese-grater' mean then?" he says. "I like colourful euphemisms, by the way. Chastise the lizard. Ice the Mexican melon. Punish the pelican." "Me too," I say. "What do those mean?" "No idea," he says. "I just made them up." "So after this lecture, we're headed back to Ian's house," I say, returning to my story. "And we stop at a little pub, perched alone among windblown trees, high up in the Yorkshire dales. The sky is black except for a few faint stars in the south." "I don't like the sound of this," my son says. "It's one of those haunted house stories where everyone dies at the end, isn't it? That's what 'play the cheese-grater' means? I hate those stories." "No, it's not," I say. "Don't worry." He eyes me suspiciously. "You used to tell me stories like that when I was young." "Not me - I sang you jolly, happy songs, like Frosty the Snowman and Busy Doing Nothing," I say, breaking into the first verse of the latter: "I have to watch the river to see that it doesn't stop. Then stick around the rosebuds, so they'll know when to pop." "Keep it down," he says. "Go on with your story then. But if it ends with 'When the lights come on again we see that everyone in the pub has played the cheese-grater', I'm walking." "Trust me," I say. "So we push open the heavy door and the pub is almost gloomier inside than out. A smoky smell from somewhere wrinkles my nostrils. We pick our way towards the bar, past murmuring shapes at old wooden tables, order two pints of Black Sheep beer then find a seat not far from the stage." "Everyone is alive still?" he says. "Course they are," I say. "The band appears - two grizzled guys on guitars, a tall chick on keyboard and a funky-looking fella carrying a tambourine and wearing a fedora. They kick off with House of the Rising Sun and they're good, so I'm drumming the table-top along with them. After a couple of Stones numbers the guy in the hat comes over and gives me his tambourine. 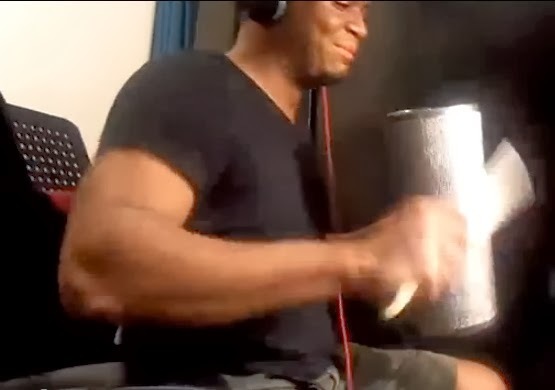 "I've never held one before but it's not hard to hit the beat with. Then he hands me this cheese-grater thing as well." "What's it look like?" he says. "Rough steel cylinder you scrape with the bendy tines of a big fork," I say. "You're talking about a metal guiro," he tells me. "It's a percussion instrument used in merengue music. The fork's called a scraper." "I tell him it's a braw, bricht moonlicht nicht, then shake his hand. Suddenly it goes dark and loud screams rend the night. When the lights come on again we see that everyone in the pub has played the cheese-grater." My son shakes his head in disgust and stands up to leave. "I'm sorry," I say to his departing back. "I couldn't help myself. Sit down again please and we'll talk about art." "Why don't you just go chuff your scroggy wassocks?" he says, but he sits back down. "Nice Yorkshire euphemism," I say. "Now what's your thoughts on the Reith Lectures being delivered this year by a hairy potter in a dress?"